Will the Healthy Rides get you fit? My big Exercise Physiology book tells me that the ideal level of exercise to improve cardiorespiratory fitness is at 70% heart rate max. 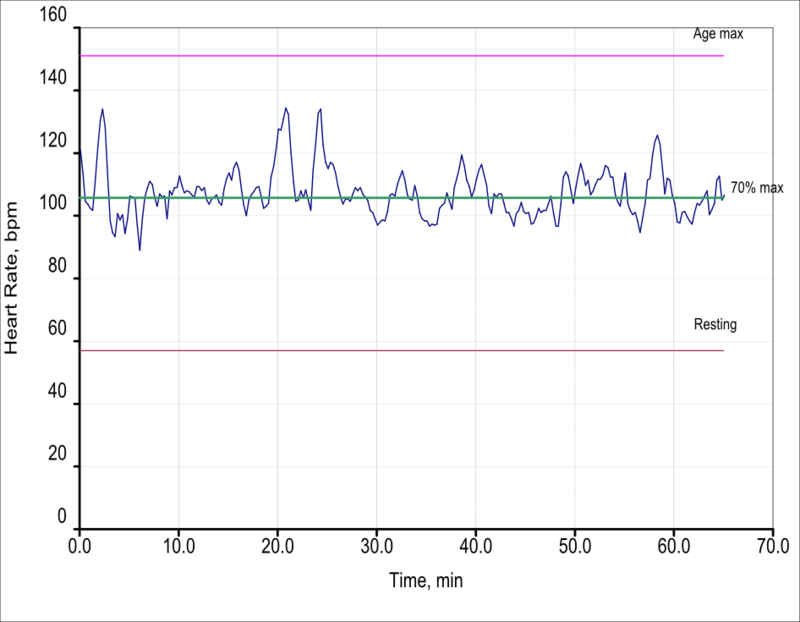 Below is my heart rate trace on the ride on Feb 9th, 2013. Average heart rate is 71% max, so almost exactly at the optimum level. This is moderate exercise. 150min of this per week is the recommended amount. So a normal 2 hour healthy ride, plus getting to and from the finish will do. Although remember that to get maximum fitness, and so health, benefit it is wise to do more than this! NB Route is on Google maps (http://goo.gl/maps/jcDhj) - see if you can work out the reasons for the occasional HR increases!